Published Bestsellers: A review of 'The House That Jack Built’, by Irene Truman, a critical reviewer for the Bronte Gazette. A review of 'The House That Jack Built’, by Irene Truman, a critical reviewer for the Bronte Gazette. "Much of this novel is semi-autobiographical. John Butler constantly cared about keeping a written account of his life with the intention of making it available to the public. An admirer of Charlotte Bronte John was particularly inspired by her novel ‘Jane Eyre’ the life of a 19th century governess. 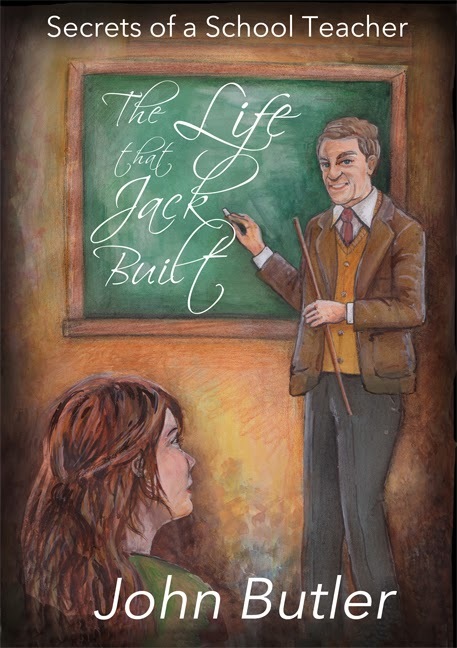 Jack Forest, the main protagonist in ‘The House That Jack Built’ finds adventure, self fulfilment and love whilst working as a teacher in 20thcentury post war Britain, as Jane Eyre did within the classrooms of 1840’s England. Jack is creative, caring and passionate. In spite of being left behind when his colleagues leave for war service he takes the opportunity to train as a teacher, facing battles within rural and urban classroom walls. Jack’s teaching career starts soon after the end of the second world war with its rationing and coming to terms with peacetime. Out of the blue he is offered a chance to go on a trip to the Cocos Islands with a group of self sufficient independent minded adventurers. It seems a risky offer in true ‘Robinson Crusoe’ style and in spite of many warnings and forebodings Jack bravely jumps in where others would fear to tread. The trip becomes a journey in search of treasure with danger, excitement and romance along the way…..’such as dreams are made of’. It ends with a sickening jolt back to reality! Many of us will find something familiar within this book. We go through life wanting to know what the future will bring and perhaps regret missed opportunities. Jack however ‘grasps the nettle’ and doesn’t have regrets. He was a good teacher; he inspired his students to do well and left his schools better places. So, after reading this book there is homework to be done. It is a heartwarming tale full of fun, excitement, information and is personal to some of us." *Irene Truman has been a member of the Bronte Society for fifteen years and has written critical reviews for the Bronte Gazette. She is a professional teacher for musicians and a steward and tour guide at Harewood House.